Here's the next page of the "corn dog" story, starting with a scan of the pencils. The rendering is pretty tight, especially when you consider that I knew I'd be inking it as well, but at least I didn't fill in all of the solid black areas with a pencil this time. 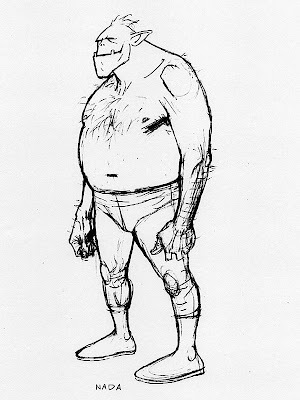 I just hit the spots that needed to be worked out before I started inking. 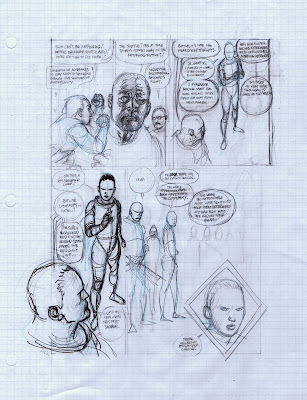 Once again, in panels two and three, some of the background was drawn after the foreground figures were pencilled and inked. I took another shot at that diagonal shadow across the vendor's head and this time I left it in. 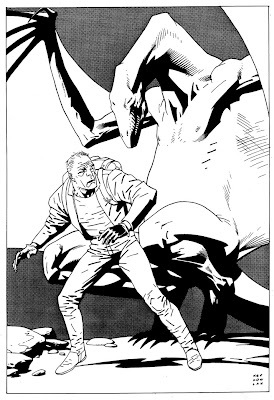 Looking at panels one and nine, I'm pretty sure I had Berni Wrightson on my brain when I added the shadows. 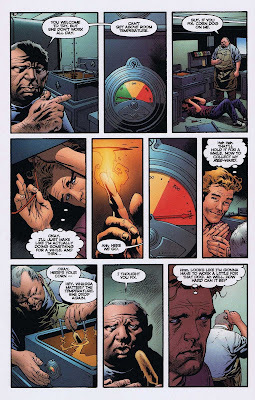 Laura (Depuy) Martin did a beautiful job on the colors and really helped me out in panels three and four by adding the shadows on Bobby's face and hands. Well, she helped me out on every panel, not just those two. She's one of the best. This is page two from "No Good Deed" in Gen 13 #36. I'm not showing you the final pencils or inks but if you compare the scans you can see how I worked out some of the background elements and clarified what I was going to do with the shadows. I'm making a mental note to attempt a blog entry on problem solving one of these days. The how-to books always seem to overlook that subject even though it's a huge, recurring part of the penciller/inker/cartoonist's job. This story didn't have any big problems to solve. The script was clear as Waterford and if we hit any snags, I don't remember them. 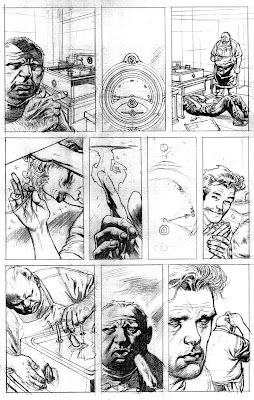 Picture one shows the pencils after all the obvious stuff is resolved. I wasn't sure about the corn dog vendor in panel one or the background in panel four. I knew I wanted some shadows in the last panel since our point of view is inside the trailer and we have bright sunlight coming in the window but I was having trouble imagining what the panel would look like if I made more than half of it solid black. So I made a copy of the pencils and started doing some sketching on it. First with a pencil, then with a fat marker. Picture two shows were that got me. A black background for panel two. fading into a crosshatch pattern and maybe a shadow cutting diagonally across the vendor's head. Panel four: The trailer on the left, carnival tent and maybe a ferris wheel on the right. 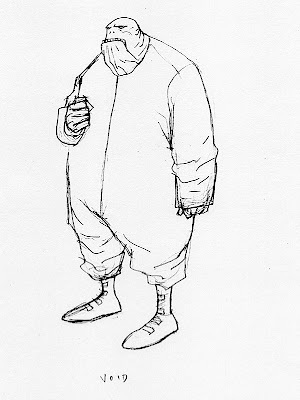 Everything should be far enough away from our main character so that we focus on him and his posture. He's bummed out because the fryer's broken and he can't get a corn dog. By the way, the kerosene lamp in the next panel is a nice touch. I wish it was my idea but it was in the script so either Jerry Prosser or John Arcudi thought of it. Seeing the final panel with all those roughed in shadows put my mind at ease. Piece of cake. Next I returned to the board and started working out those details in pencil and inking the areas that I was sure about. That previous step might've seemed like a waste of time but it helped me to see where I was going so I think it was worth it because it made the rest of the pencilling go a little faster. 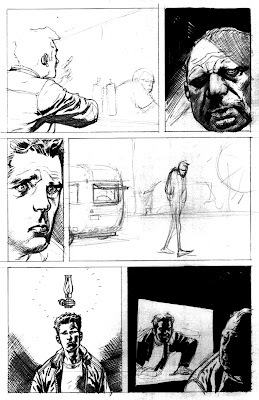 I ruled some light perspective guide lines in the first, fourth and final panels. These can help suggest details as well as giving you a guide for freehand drawing. I moved the ketchup and mustard containers so our vendor is peaking over them. 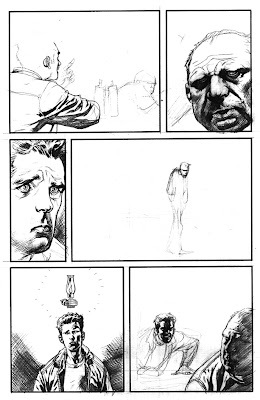 Then I finished the pencils on our disgruntled hero as he walks away in panel four. I inked him next so that I wouldn't have to worry about smearing his lines if I did a lot of erasing and redrawing on the carnival buildings behind him. A little detail on the sliding window helps us keep our bearings and maybe a little cross hatching in the open space so that we get the sense that there's other stuff back there, it's just out of focus. 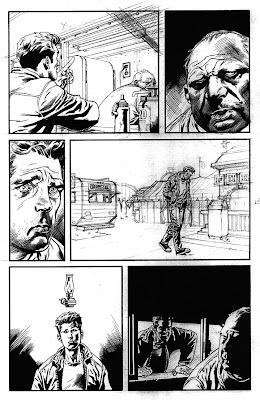 I also decided not to put the shadow across the vendor's forehead in panel two. I'm not sure why because I think it would have worked fine, but I just chickened out. Or maybe I just forgot. I'll wrap this up by mentioning the research that I did before I started drawing. Today I'd probably just do a quick web search but back in 1997 I was frustrated as I tried to figure out how corn dogs were supposed to be deep fried. In baskets, like french fries? Hung from a custom apparatus? I didn't have a clue. So I did what we used to do back in the dark ages; I asked around. My brother hooked me up with a friend of his who owns the Pronto Pup concession at our local State Fair. He opened up one of his stands on a cold winter day and very enthusiastically showed me how it all works. I never showed him the story because it paints his product in a slightly negative light but I really appreciated his help. The vendor in the story was not based on him. Not even a little bit. The first image above shows me scribbling around, looking for an idea. 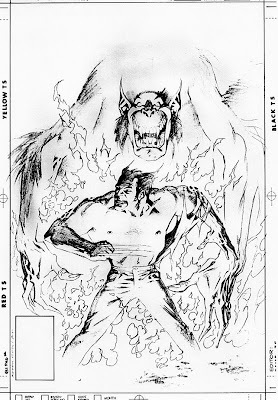 As with most of these pin-up assignments and even some covers, the editor didn't have anything specific in mind so the concept was up to me. The large drawing looks like I was trying to get a handle on her personality. The big fist below it looks like a leftover from another project. In fact, the sketches were all done on the back of a Batman: Sword of Azrael script. I like the idea in the lower left; especially her body language, but figured I'd better show her face. 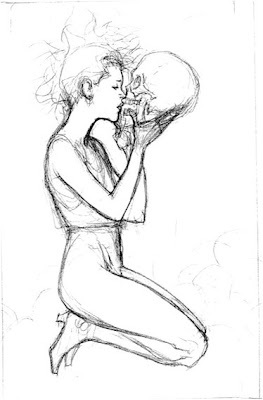 The upper right drawing shows the idea I decided to go with although I dropped the pile of skulls behind her. More "Seduction of the Innocent Revisited"
Two posts earlier I mentioned the 1990 book Seduction of the Innocent Revisited. Here's another Wolverine cover of mine that was featured in a chapter called "Negative Role Models". If the author wanted to promote a vegetarian diet and criticize me for showing Wolverine eating raw meat, I'm cool with that, but how does he know the bird is still alive? It looks dead to me. Maybe he didn't notice the bird's head hanging limply from its body. He's probably just sleeping. What an ugly type face. It doesn't even look like "comic book lettering" to me. 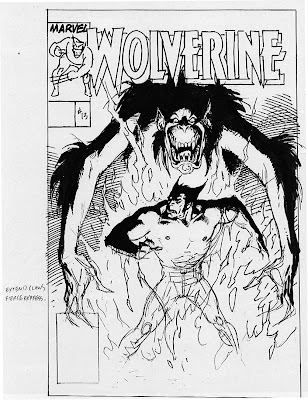 From 1989; the sketch, pencils and inks for the cover of Wolverine #13. 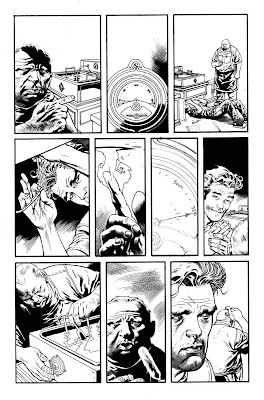 The following year this piece and a back cover I drew for Wolverine #3 were featured in Seduction of the Innocent Revisited. I probably should have been ashamed but I thought of it as a badge of honor. 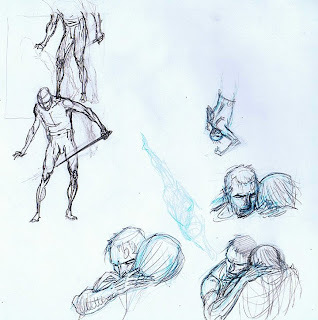 I'll be talking more about Grimwood's Daughter later but for now I'll share a few preliminary sketches from the final chapter. 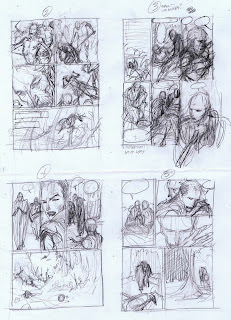 First, some rough thumbnail sketches. These are tiny, four on a sheet of typing paper. I was just trying to work out the basic compositions and see if things would fit. Balloon placement and the flow of the story were two of the main concerns at this stage. 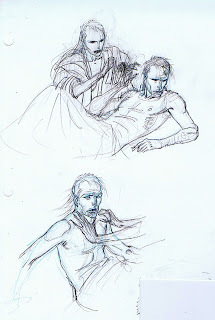 I also try to get a feel for the gestures and attitudes of the figures. Next, I started working out the individual panels at a larger size. Working at this size on a sheet of scrap paper is very liberating. You can start over as much as you want, flop images, come back to an earlier take. There's no rule against moving from thumbs to the finished board but I do better with several stages to refine the drawings. 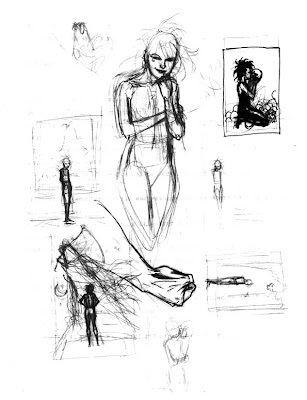 I ended up using that last sketch, in the lower right corner, but I cropped in tight on the guy's head and hand. If I had it to do over again I think I'd pull back a little and so that we see both characters a little better. The body language is very important here and I lost some of it when I moved in closer. 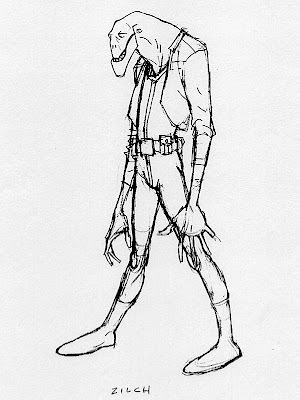 I did three of four of these, early on when the movie was just called Bugs/MJ or something like that. 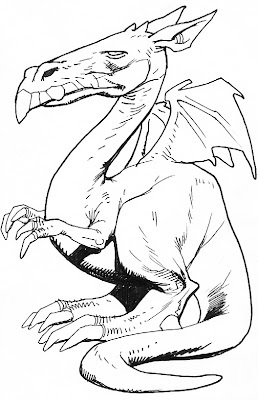 I think Mike Mignola and Arthur Adams did some sketches as well. I don't think they used any of them. Something a little different. I did this little sketch for my son 10 or 11 years ago. His standard request was either a dragon or a werewolf but just to mix things up a bit I'd occasionally throw in a Frankenstein or the Creature from the Black Lagoon. If the results made him grin I knew I'd really hit a home run. I think this is a cover that really looks better in color. Again, the editor giving me free reign really helped. Most editors wouldn't let artists do their own color guides at the time but Carl was always agreeable. The same thing happened inside the book. 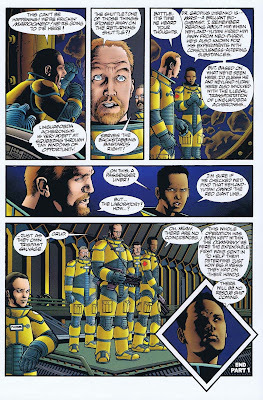 Carl asked me to ink the first story and I somehow ended up doing the color guides as well. You can tell that wasn't the original plan because of all the zip screens I used, hoping to limit the damage that an unsympathetic colorist might do. 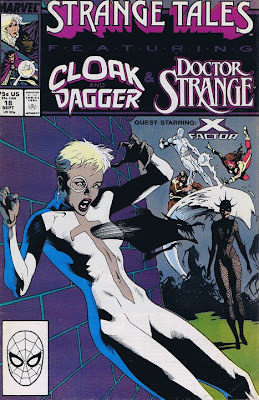 I like the way the demon emerging from Dagger's chest looks semi-transparent. 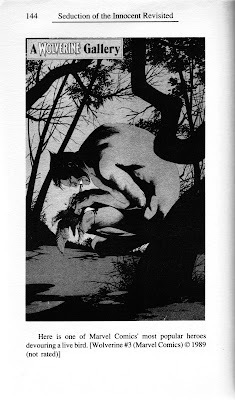 That's not an easy effect to create with pen and ink. Looks like I forgot to draw her necklace. 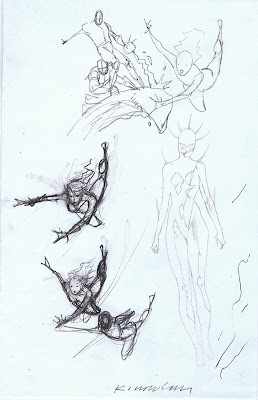 These thumbnail sketches show me struggling to work out the poses for the background figures. There wasn't much space and I wanted to make them as lively and dynamic as possible. I found this recently when I was going through some old files. 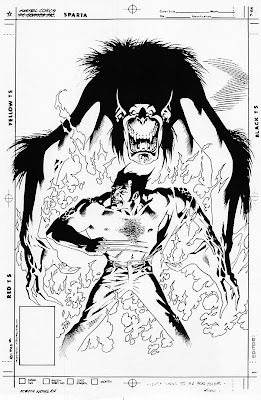 Most of the Marvel covers that I drew back in the late '80's were for Carl Potts. 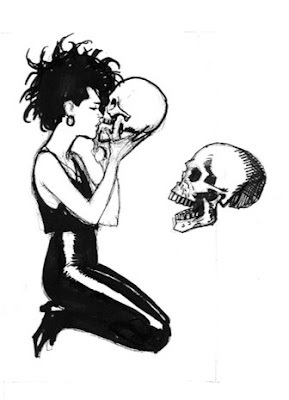 He would send me sketches like this and I'd do the rest. Carl was always a pleasure to work with. When I told him I wanted to do more lettering and less drawing, he sent me a bunch of lettering assignments, including two of the three logos on this cover. 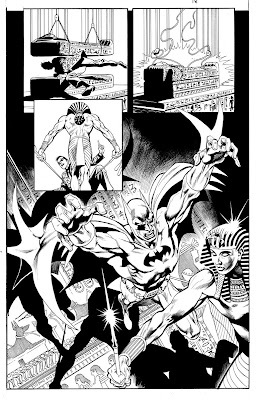 ...to pick up Batman: Confidential #28 today. If your comic shop sells out you'll miss your chance to see more cool art like this. Brian Stelfreeze very generously and patiently walked me through this painting process: Tight pencils on a gesso surface, airbrushed acrylic sprayed over the pencils to add color and fix the graphite, then more acrylic applied with a brush and finally some rendering and detail work with colored pencils. It worked so well that on a simple piece like this, I could finish an entire painting in a single day. 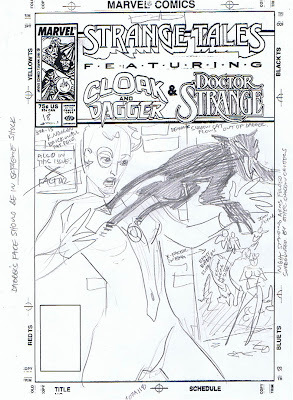 After an exhaustive search, I was unable to find the old color copy of the original art for this cover, but I found a copy of the pencil sketch. I'll post it next. The anonymous poster who requested a larger scan of the art, sans type, may be disappointed, but I suspect that he or she isn't missing much. 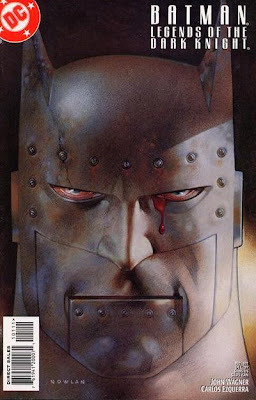 The DC bullet and title barely cover the corners of the image. The original painting doesn't really have anything that the printed book doesn't show... maybe just a little more grit and texture. If you were looking at the 11 x 17" painting you'd probably be able to see more clearly where I went from graphite to airbrushed acrylic to colored pencil but there aren't microscopic layers of detail to be discovered. What you see is what you get. This cover was a joy from start to finish. 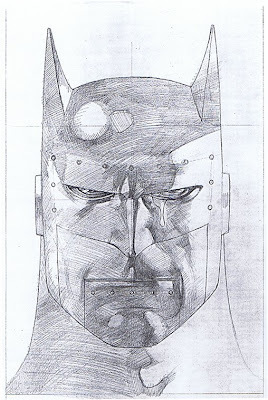 Archie Goodwin called me up and described what he wanted: A metalic Batman with human eyes and a single tear, blood red. 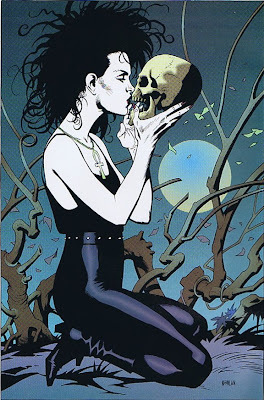 If you read the story, you can appreciate what a poet Archie was for coming up with this image. The robot never bled from its eye and we never saw human skin behind the metal. Those little details were all all Archie's. I don't think it was a bad story, it just struck me as being less mysterious than the cover concept. Among his other gifts, Archie had a unique imagination. I wish I could have worked with him more. This story required a specific point of view for every panel. This layout shows my first attempt at pulling it all together but I had to redraw most of it because of the "camera" angles. If they didn't show the scene from one of the characters' eye level it wouldn't work. That final close-up needed to be dramatic so I drew a tight sketch and put a heavy shadow on it. I wrinkled her brow a bit in the final version. I don't remember much about this one. Jan Strnad and I proposed this Sci-Fi project somewhere and it never got off the ground. It must have been around 1988 or '89. This is the only art I produced for it. Sorry about the inevitable moiré patterns from the zip screens.